BASHO about ‘haiku poet’ and ‘haiku master’ ..
HAIKU MASTERS is an interactive NHK World TV program which seeks to find haiku masters from around the world using a new form of visual literature called Photo Haiku. Viewers from around the world submit their Photo Haiku for the resident haiku masters to critique using their wealth of experience and uncanny perspectives. HAIKU MASTERS won the World Media Festival 2016's Web-Based Mixed Media intermedia-globe Gold Award. 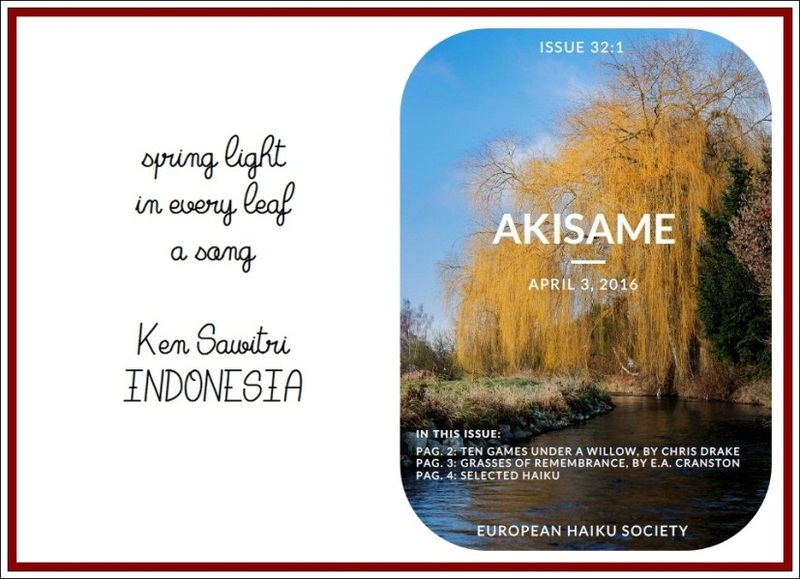 "Kampung Halaman, Haiku and Haiga from Indonesia, Haiga by Ken Sawitri and Jimat Achmadi"
Nicholas Klacsanzky, the editor of Haiku Commentary, an online journal for the analysis of haiku and related forms, is a widely-published haiku, senryu, and tanka poet, and a technical editor by profession. He is a mentor for haiku, senryu, and tanka on the online group Poets on Google Plus. He was conferred with a certificate for being one of the top 100 haiku poets in Europe in 2015 and 2016 by Haiku Euro Top curated by Krzysztof Kokot. 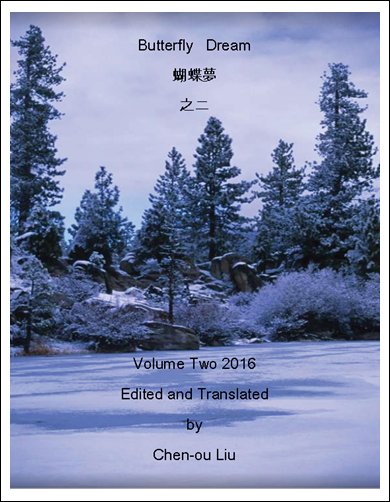 Nicholas wants to carry on the tradition of his father George Klacsanzky, a pioneer in the haiku scene in America, with his publication Haiku Zasshi Zo, by promoting haiku further. Today, Indonesia getting the honoured being appreciated in his precious blog! Thank you Martha Magenta, Dana Grover, Jacob Salzer and Nicholas Klacsanzky for giving the commentary. It was all delicious, and I appreciate all you’ve done. I think this haiku contains an opportunity for a mix of interpretations. In fact, I believe the author intended for us to get a visceral reaction out of it: one that is at once shocking by the image, and awed by the beauty of the moon. To me, these qualities make it a strong haiku, as it reflects life: life is mixed, with good in bad, and bad in good. The plastic bag is flimsy, unnatural, and a thing eventually meant to be thrown away. Yet, here in the haiku, it has the dignified duty of carrying the light of the moon on the stork’s head. This act can have many interpretations, but the spiritual meaning could be that the stork feels a sense of enlightenment and it has gone beyond its mind or individual self. It seems like a representation of a loss of ego and becoming one with the spiritual self. This haiku does carry overtones of death, but that could be the death of the ego, and the “attainment” of enlightenment. The haiku portrays a disturbing moment, however the heron could theoretically shake the plastic bag off its head in an instant. But we are kept in suspense, and this marks one of the qualities of haiku: since it is a fragment of a sentence, the poet can create mystery quite easily. Even the sound of the haiku demonstrates a mixed feeling. The “o” sound in “stork,” “moon,” and “on” brings a soothing resonance. However, with the hard sounds of “plastic,” “bag,” and “wraps”, the haiku delivers a harsh feeling. 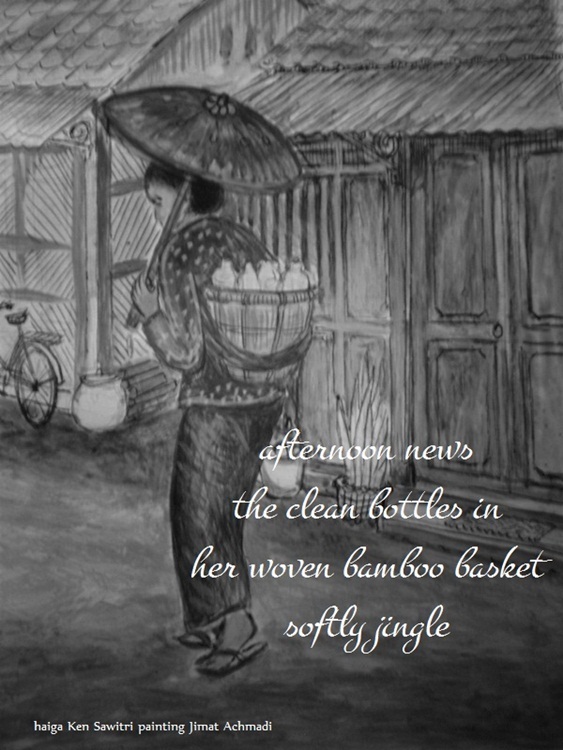 The open and striking nature of this haiku allows one to ponder its image for a while. I think like a good haiku, it cannot be pinned down in meaning and mood. NHK WORLD TV, HAIKU MASTERS SPECIAL EDITION 2017, TODAY! I’m honoured and touched beyond words. In this special edition of HAIKU MASTERS: 1st Year in Review, Haiku Master Michio Nakahara-sensei , Haiku Poet Kit Pancoast Nagamura, and special guest Professor Toshio Kimura-sensei take a look back on some of their favorite pieces over the past year from our international haiku masters and rediscover what makes a great Photo Haiku. In addition, the group goes into detail about our guidelines by answering common viewer questions. 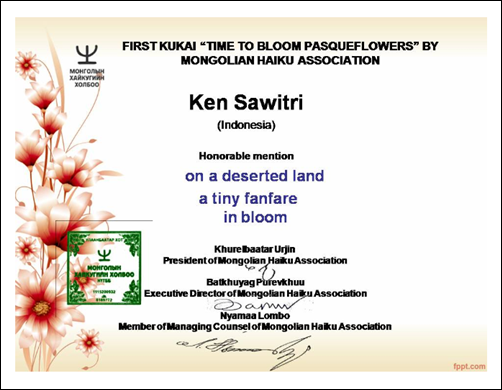 Thank you Haiku Masters Board for giving my humble work the opportunities being appraised and favorited! A very warm and hearty thank you for the support, guidance, and encouragement. HAIKU MASTERS, peraih penghargaan dunia Gold Award Web-based Mixed Media intermedia dalam World Media Festival (2016), adalah nama sebuah program TV di stasiun NHK World yang bertujuan mencari dan menemukan Haiku Master internasional melalui bentuk literatur visual baru yang disebut ‘photo haiku’. Para pemirsa dari berbagai penjuru dunia mengirimkan karya ‘photo haiku’ mereka untuk dievaluasi berdasarkan kekayaan pengalaman dan perspektif yang tak terduga oleh para Haiku Master tuan rumah di NHK World. Hingga Episode 12, program ‘HAIKU MASTERS’ telah menerima 5.303 kiriman ‘photo haiku’ dari penjuru dunia, yang berasal tidak kurang dari 96 negara dan wilayah. Acara televisi ‘HAIKU MASTERS’ Episode 12 telah disiarkan langsung di Jepang pada hari Senin, 27 Maret 2017 pukul 16:30 / 22:30 Universal Time Coordinated (UTC d/h GMT) atau Selasa, 28 Maret 2017 pukul 1:30 / 7:30 Japan Standard Time (JST). Siaran ini bisa disaksikan di Indonesia melalui edisi NHK World Video on Demand terbatas hingga 24 April 2017 nanti. Terimakasih kepada teman-teman dan handai taulan, yang selama ini telah memberikan dukungannya. 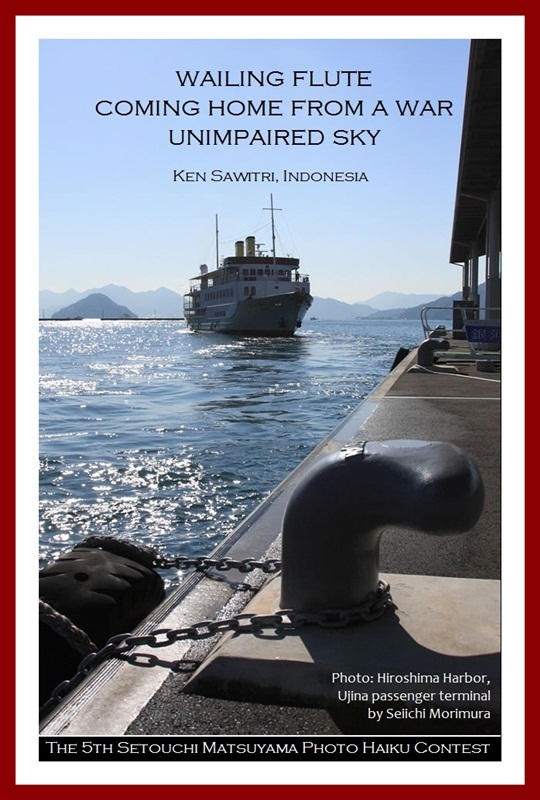 Posted by indonesiainmyhaiku on September 25, 2018 in book, collaboration, haiku, hot peppers ! 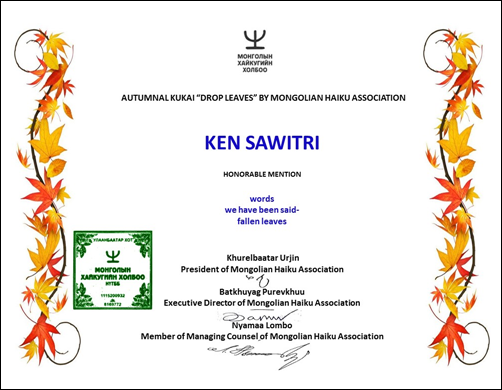 on the publication of your book “Wokot haiku – Around the Haiku” (2017). 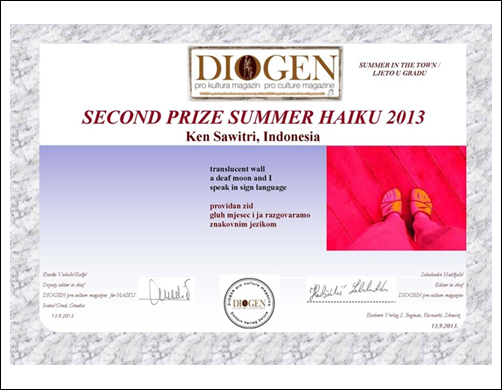 Thank you, I am honoured receiving the precious chance to translate three of your Polish haiku in it! 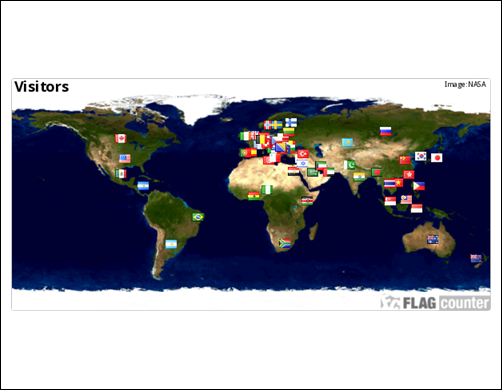 ISSN 8755-­156X Listed in the MLA International Bibliography, Humanities International Complete, Poets and Writers. Cover Design and Photos: Christopher Patchel © 2013 by the Haiku Society of America, Inc.
Haiku is an antidote to human indifference. Scott Mason at #hna2015: #Haiku gives us a second chance to notice and come to know what might be extraordinary but is commonly overlooked. Industri kretek g rontok krn cukai. Cukai biar naik asal unt negara.